3 Bedroom Semi Detached House For Sale in Worcester for Offers in excess of £270,000. 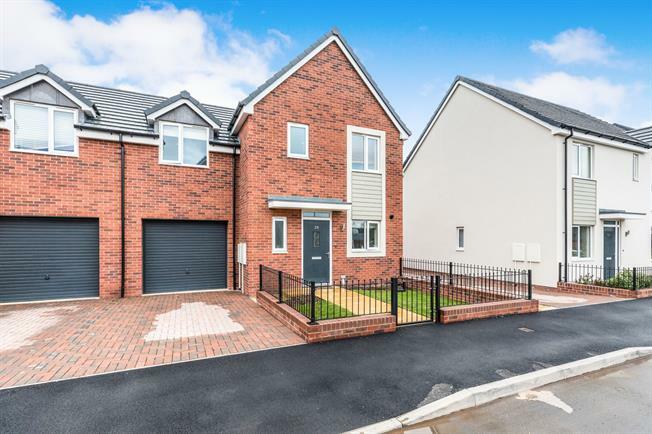 This modern three bedroom semi detached property was built in 2017 and is located within easy access of junction 7 of the M5. The property is in the catchment area for Whittington Primary School and Nunnery Wood High School and has 9 years remaining on the NHBC. The property comprises of an entrance hallway which leads through to the cloakroom, kitchen and lounge. The kitchen has an integrated oven and hob. The lounge has a dining area and patio doors onto the garden. To the first floor are three bedrooms and the bathroom. The master bedroom has a dressing area and en-suite shower room. The rear garden is laid to lawn and patio. There is a garage and parking for one vehicle. The property is accessed via a part glazed door which leads into the hallway. The hallway has stairs leading to the first floor, doors leading through to the cloakroom, lounge and kitchen. Opaque double glazed window to the front aspect, low level WC, pedestal wash hand basin with tiled splash backs behind and radiator. Double glazed window to the front aspect, range of base and wall mounted units with work surface over, plumbing for dishwasher, space for fridge freezer, integrated oven and hob with extractor hood over, one a half bowl sink unit with mixer tap and tiled splash backs, wall mounted ideal standard boiler and radiator. Double glazed window to the rear aspect, double glazed french doors onto the rear garden, two radiators and fitted cupboard providing storage space. Access to the loft, fitted cupboard providing storage space and doors leading through to the bedrooms and bathroom. Double glazed window to the rear aspect, radiator, opening into the dressing area with a fitted mirrored wardrobe which provides shelving and hanging space and door through to the en-suite shower room. 7'02 x 5'10 plus 3'02 x 2'05. Velux window to the rear aspect, low level WC, pedestal wash hand basin with tiled splash backs behind, shower cubicle with power shower and heated towel rail. Opaque double glazed window to the front aspect, low level WC, pedestal wash hand basin with tiled splash backs behind, panelled bath with shower over, part tiled walls and heated towel rail. A pathway leads to the front door with a lawn to either side. The front garden is enclosed by railings and gate. The pathway also gives access onto the driveway where there is parking for one car. The rear garden can be accessed via the french doors from the lounge. A patio area is immediately in front of the lounge and a pathway continues from this across to the garage and gated side access. Beyond this is a lawned garden. The garden is enclosed by panelled fencing. Up and over door, double glazed window to the rear and part glazed door onto the garden. 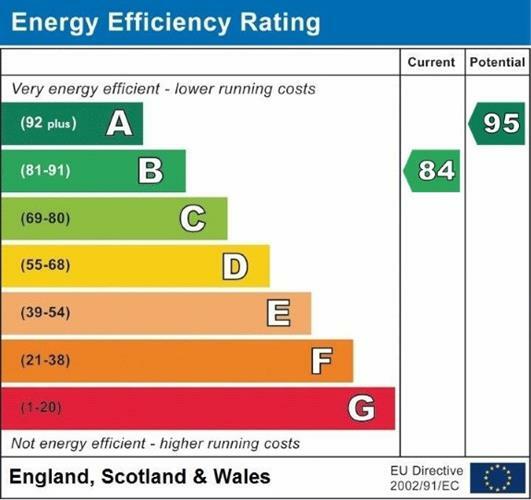 The garage is on a separate power circuit which is rated for electric car charging.